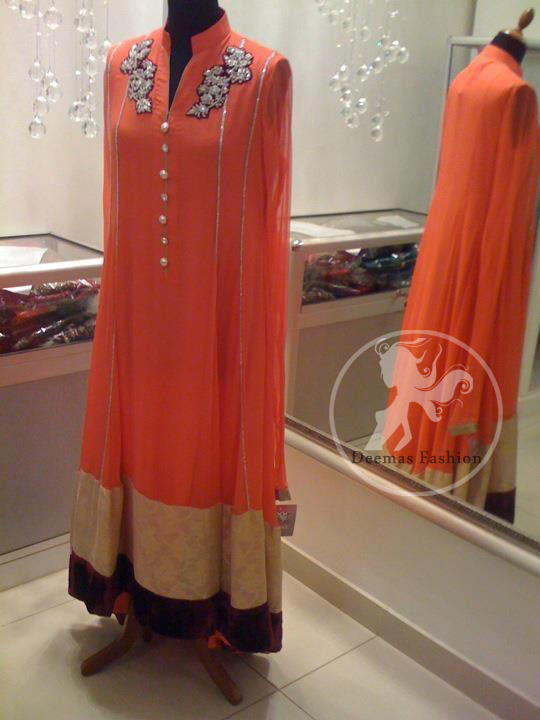 Tags: Anarkali, Churidar Pajama, Long Length, Orange. Orange pure chiffon full length anarkali frock. Embroidered motifs implemented on both shoulder. Maroon velvet is used as applique under the embroidered motifs. Hemline is finished with maroon velvet. Dull golden banarsi fabric is attached before hemline. Fully lined dress. Concealed with back zip closer. Orange pure chiffon dupatta. Dupatta is finished with maroon velvet and golden banarsi fabric. Orange pure raw silk churidar pajama.